Are you ready to transform into one of the most honorable warriors in all of history? We are talking about, of course, the legendary samurai! Now with this amazing Black Samurai Adult Costume, you can take the battlefield by storm, or at least enjoy an awesome costume party. This costume is as fierce as it is easy to toss on. This getup comes with an awesome robe that, for the majority, is black. It will help you sneak around in the dark and give you an upper hand on any foes you cross paths with. The cloak also has red accents at the end of the sleeves and the belt is also entirely red... blood red. It will subtly remind your enemies of the blood you are ready to shed if need be. 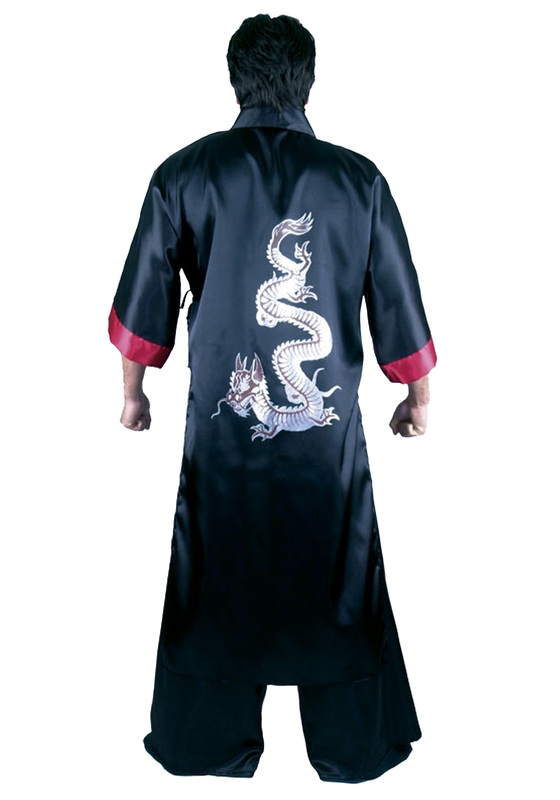 Finally, on the robe, there is also a silver dragon graphic. When adversaries lay their eyes on this emblem, they’ll start running for the hills. No one wants to go toe to toe with a dragon warrior. Most only believe them to be the stuff of legends, merely myths. But when you walk into the party scene this year, everyone will know that the stories were all true. Complete this new and honorable look with the perfect katana. Remember, a true warrior does not pick his weapon the weapon chooses him. 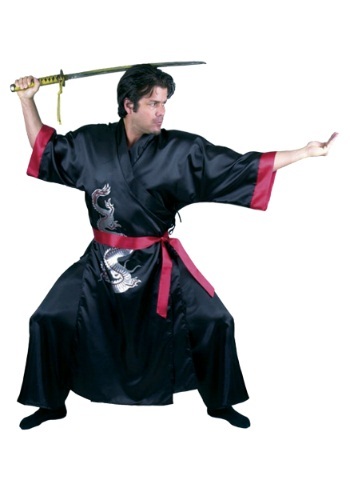 So toss this Black Samurai Adult Costume, arm yourself with one of our many swords, and you’ll be ready to take on any challenge. Whether it’s armies of knights, endless hordes of ninjas, or just a night full of Halloween fun, you’ll surely be victorious! The outfit is good but the cheesy sword is the thing that ruins it.